When basketball or any other sport for that matter comes on TV, I find something else to do. Unless Duke is playing, and then I’ll check the score from time to time. 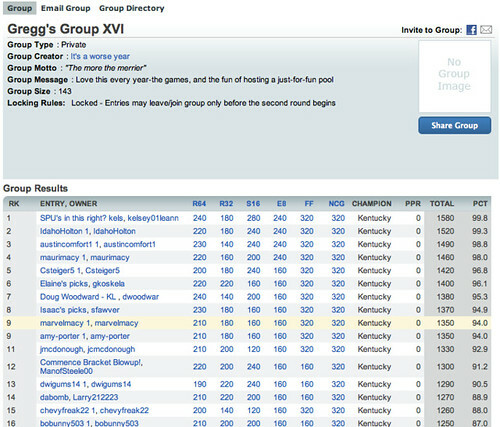 So why do I find so much fun in choosing teams for Gregg’s March Madness bracket competition? I can’t figure it out either. Mauri and I didn’t confer when we made our choices. Mine were obviously completely based on guess or allegiance or sentiment (i.e. my mother was born in Louisville) or seed. But look! Out of 134 participants, Mauri’s bracket came in 4th! And mine tied with friend Amy for 9th! We will sleep satisfied tonight—but will probably still not plan any trips to Vegas. You guys win for best couple! Great work! Way to go. I finished 38th. My best showing so far. And look there at #1! I think I was more proud of Kelsey winning the whole thing than I would have been had I won myself! Haha. Love it. Good times.